I have been wanting to do shows in homes for a while, and now that I’m out of school, I can dedicate time to it! 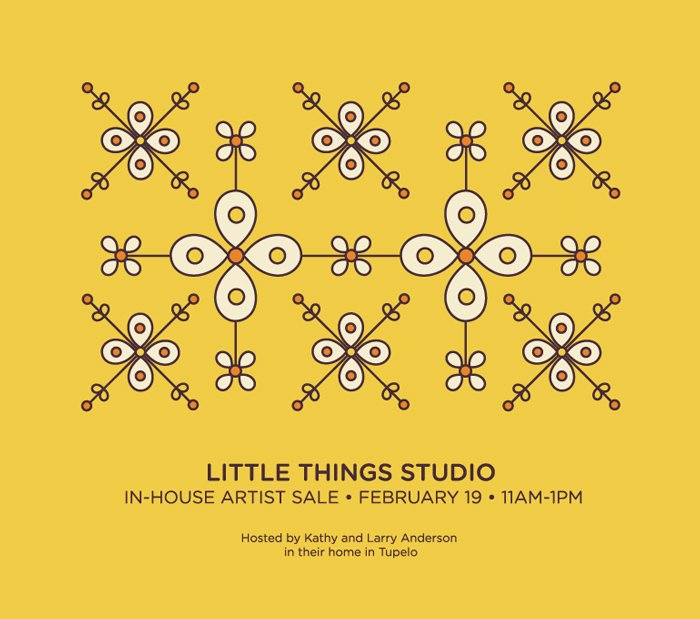 Little Things Studio comes to you! My web teacher Chad Anderson told me a while ago that his mother had seen some of my work and loved it. One thing led to the next and I’m heading to Tupelo this next weekend! Kathy has graciously opened her home to me for a few hours! I mailed her some posters. She’s printing out some postcards and inviting her friends! I’m so excited about this! I’ll post pictures of the event once it happens! So if you (whoever you are that reads this!?) are interested in a house party, please contact me! I would love to come visit. Invite your friends, I bring little things. Oh! And you will of course get a large helping of hostess happies.